In Latin America the plaza’s of the cities become urban playgrounds for family and friends. 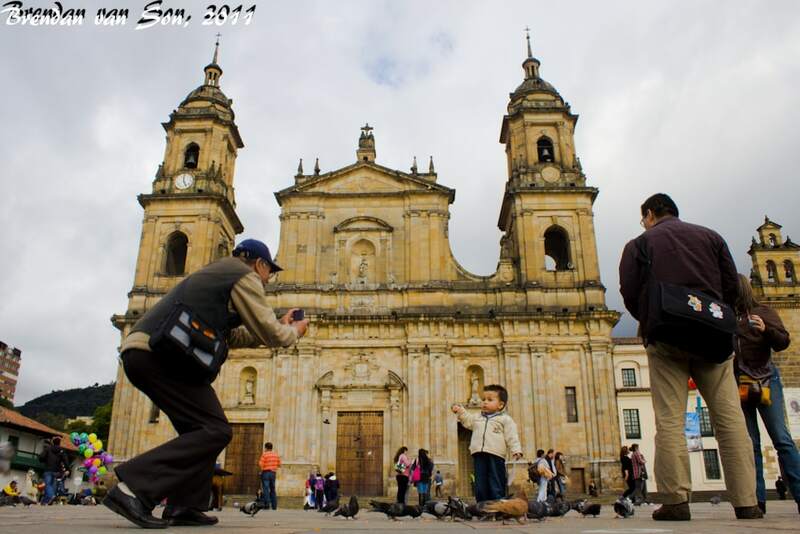 Locals and tourists alike head to the plazas to people watch, engage in conversations, but most of all to shoot photos of one and other. The arrival of camera phones, in particular, to Latin America means that basically everyone has the tools to shoot photography. Coupled with the rising power of facebook, getting great personal portraits to show off to your friends has become more than just a desire but an obsession. It is as entertaining as anything to watch girls strike their sexiest pose, guys doing their best to look tough, and couples trying to capture their love affectionately on digital film while loitering in the plazas. Personally, I could sit and watch the societal behaviours created by the rise of photography all day. In the end, I decided to try to capture some of their moments myself. To the right you can see the proud parents watching as their son has his photo taken by a “professional” photographer in the plaza. The photographer is actually doing the right thing in capturing children by getting down to his eye level. For my shot I am doing something similar. One of the greatest photography tricks you can ever learn is to shoot from an eye level different than the usual 5-6 feet off the ground. Shooting from lower or higher than usual gives what might be a fairly usual scene a different dimension, a different feel and look than our trained eye is used to. One of my favourite quotes is “if we continue to walk on the sidewalks that life provides us, we only see the world the way that everyone else does.” This goes for photography as well, shooting from the usual eye level creates the same usual photos as everyone else gets. I took this photo with my camera touching the ground. I have such great memories from my time spent in that plaza! I love the human element you chose to include in this shot. I would have just gone for the building, but glad to see your perspective. We were just there yesterday! Totally noticed the camera phone phenomenon at a concert last night…some people had their hands up for photos the entire time and everyone was posing. Great shot and tip!